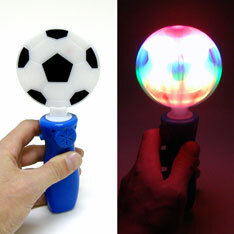 As the flat soccer ball disk spins, the ball appears to be round and glows from LED Lights in the handle. A neat soccer spirit item! Uses 3-AAA batteries (not included) Sold individually. Blister packaged with header card. $2.85 each for 36 or more. $2.55 each for 72 or more.